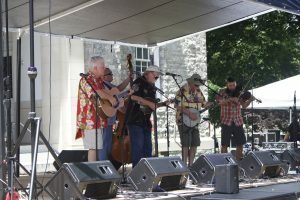 Bluegrass on the Grass, a Carlisle summer tradition, took the Dickinson College Academic Quad by storm on Saturday, July 8th. Lasting 8 hours, the festival hosted five different bluegrass bands, hailing from Tennessee to West Virginia. Families, students, and devoted bluegrass fans from Carlisle and beyond alike showed up and gave their support for a festival that has been around for more than 20 years now. 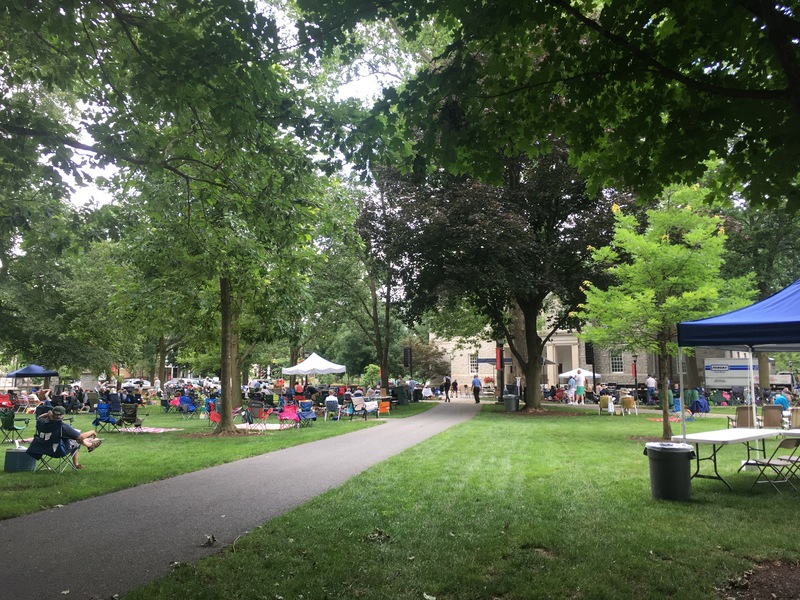 Festival-goers arrived as early as 8 am to claim the best spots on the Academic Quad, in the shade of course, and camped out there throughout the whole festival, proving just how loved this festival is! 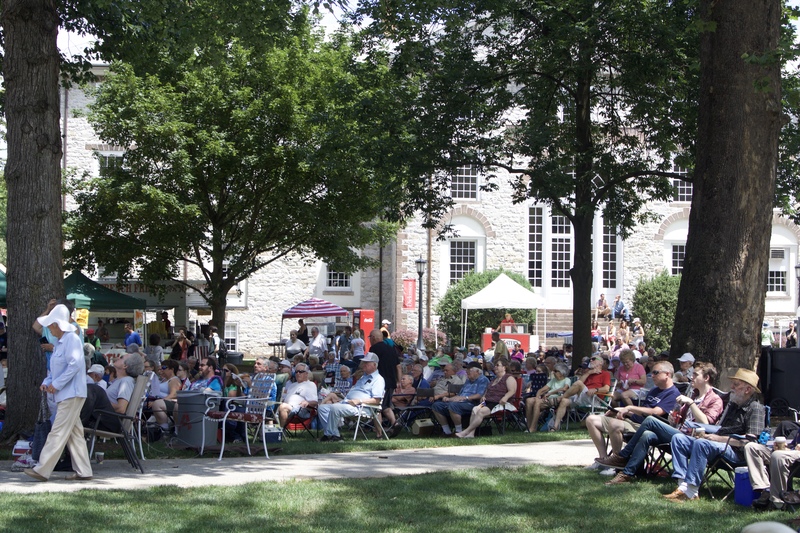 Children danced along to the quick fiddles, families enjoyed the crooning of their favorite bluegrass singers, hungry listeners appreciated the local food vendors, and Bluegrass on the Grass volunteers savored the support they felt from the festival lovers. This tradition started many years ago by the infamous Davis Tracy. A retired Dickinson Counselor and faculty advisor for WDCV FM, Davis Tracy and other local bluegrass lovers hosted bluegrass concerts on Tracy’s farm back in the 90s. They wished to expand their barnyard concerts, invite other bluegrass musicians and listeners, and create a festival out of their love for bluegrass, and in 1996 Tracy and others created a reality out of this dream. 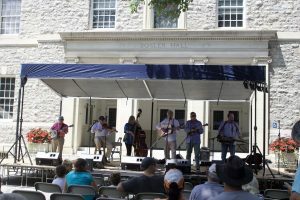 Tracy and his band took the stage on the Dickinson campus for the first time in front of about 200 people, and since then the festival has grown to nearly 4,000 attendees and a multitude of bluegrass bands who have received high regard in the bluegrass world. There is no doubt that every summer, the town of Carlisle gleefully awaits this music festival. The bands featured this year included some familiar faces, such as the Dismembered Tennesseans, but also comprised of new sounds, most notably from Mile Twelve, a relatively new band with a young, fiery sound. An astounding fiddler, Michael Cleveland, along with his band Flamekeeper, joined the line-up this year as well, and left the crowd in pure amazement of his incredible skill and musical ear. 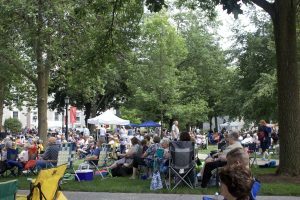 The music lasted from noon until 8 pm, interspersed with raffle contests, in which Bluegrass on the Grass merchandise and other impressive prizes were given to upwards of one hundred winners. 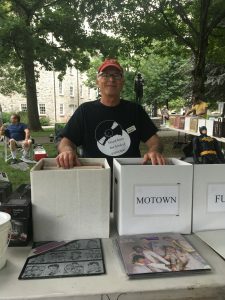 Dennis Gotthard, a local vinyl collector, sold a multitude of vinyl to festival-goers, and impressed the crowd with his boxes and boxes of bluegrass vinyl for the true bluegrass fans. Bluegrass on the Grass was an immense success this year, attracting new faces both on stage and in the crowd. It was a lovely day filled with great music, and no doubt the town of Carlisle excitedly looks forward to next year’s event!